Hold on to your loose change, kiddos, because Kupo Games' Bullet Heaven 2 has arrived with all the snarky, dazzling, arcade-style shooter action a body could hope for, lovingly tarted up with the cast of Epic Battle Fantasy. 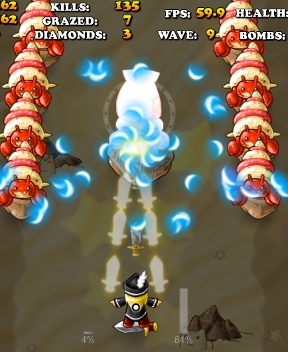 Soar through levels filled with enemies, bullets, and cash for upgrades, as one of several different characters with their own special attacks and strengths, and go up against enormous bosses. If you want to support the developer, you can also choose to pick up an optional expansion pack for about $10.00USD on Kongregate, which includes more characters, stages, and other goodies! Fair warning, if you're particularly sensitive, you may not appreciate the jokes about killing and eating cartoon cats in the beginning, though it shouldn't come as a surprise given the series' reputation for being a little crass. As with the original game, Bullet Heaven 2 allows you to play with the keyboard, but the default is mouse to move, and click to fire. Don't worry if your avatar seems too big to possible dodge all the brightly coloured death flying at them... all you have to worry about keeping safe is the little white dot in the middle of their sprite that represents their hitbox. You can only take so many hits, of course, and if you die, you'll have to start the level over. The cash you earn can be spent on different characters and weapons, as well as "cheats" like faster movement or coin magnets that detract from your high score... or, if you prefer, you can pick up a "handicap" that might, for instance, make your enemies stronger and faster while giving you a bonus to your score, if you survive. Hey, you wanna be the very best, right? Like no one ever was? Well, put your coins where your mouth is, and prove it! Like the original Bullet Heaven, the sequel is a lot harder than it initially seems. While your hitbox is only a single pixel, there's so much going on onscreen at any given moment that it's still easy to get overwhelmed if you take your eyes off it, especially given how small and glowy some projectiles are. You can actually watch the indicators at the bottom of the screen to see where enemies are rather than the enemies themselves. You can swap between your main and sub weapons by double-clicking, and the way both take various times to recharge forces you to adapt on the fly to any situation with fast reflexes. It can turn a bad situation into a... slightly less doomed one, especially since your weapons act differently when closer to full power. Technically speaking, it's less grindy than its predecessor, since it clearly expects you to be able to complete the game without purchasing a "cheat" upgrade to make it easier, but you'll still have to power through a lot of levels if you want to be able to afford other characters and weapons. Stages themselves can be long, since they're made up of ten waves of enemies plus bonus rounds, so as vibrant and adorable as everything is, you may find it drags a bit in places with enemies that mostly behave the same way apart from the style of bullets they fire. Despite the brighter, bolder visual style and overall coat of polish, however, Bullet Heaven 2 is still going to feel very familiar if you played the original game, and largely that's a good thing. As with any good arcade-style shooter, it's less about mindlessly spraying bullets while going "ARRR" and more about forcing yourself to move carefully, making ample use of the left-[shift] slow down for your avatar when things get particularly insane. If you like shoot-em-ups, Bullet Heaven 2 is a great homage to the genre made by a talented team that clearly knows what they're doing, and love every second of it. If you want to get the 'get a perfect on stage X-13 on heavenly' medals a bit easier, run through the thing on normal first to unlock the bonus stage in question and use the level select's stage select function to start at the end. No cheats are allowed, but you can turn on the 'no death-bomb' handicap to keep yourself from using a bomb on reflex and 'one heart' so you can restart faster. Could someone please explain how to get the game to work with Xbox controllers? Apparently it needs more than just plug and play. Do cheats stack? I.e., can you activate all 3 "bullet speed" cheats and get -30% bullet speed?